A village located a few miles west of Gt Yarmouth. The memorial cross was unveiled by the widow of G K T Fisher, listed below, 10th December 1922. The memroial takes the form of a cross mounted on a tiered base inset into the churchwall, whichis recessed. Possibly: Robert Dyble. Gunner 11536. 25th Div. Ammunition Col., Royal Field Artillery. Died Tuesday 13 August 1918. Born Great Yarmouth. Enlisted Reading, Berks. Buried: VAUXBUIN FRENCH NATIONAL CEMETERY, Aisne, France. Ref. II. C. 2. ELDEST son of George C. Fisher, successively Bishop of Southampton and Ipswich, and Hon. Canon of Norwich, of Burgh House, Fleggburgh, Norfolk, and of Mary Penelope Gwendoline, daughter of the late T. C. Thompson, of Ashdown Park, Sussex, late M.P. for Durham City. New College, Oxford, B.A., 1902. Studied Art under Mr. G. A. Storey, R.A., Mr. Frank Brangwyn, R.A., and Mr. Arnesby Brown, R.A. Travelled in Asia Minor and the Balkans. Took an appointment in the Labour Exchange under the Board of Trade. Married, in 1914, Janet Katherine Mary, daughter of Mr. and Mrs. Anson and sister of the late Sir Denis Anson, Bart., and leaves two sons. Captain Fisher was given a Commission on the outbreak of the War in the 4th Norfolks and with them sailed for Gallipoli in June, 1915, taking part in the landing at Suvla Bay. He was mentioned in Despatches. He was invalided home suffering from dysentery and then held a Staff Appoint­ment and subsequently a position in the Ministry of Munitions, but returned to his Regiment and sailed for Egypt in March, 1917. On the night of September 2nd, 1917, he was out on patrol and, being somewhat in advance of the rest, was mortally wounded by a bomb thrown by a Turkish sniper. He was brought back into the lines by the patrol, but died a few minutes after his return. He was buried in the cemetery four miles south of Gaza. Possibly: Private DM2/171259. "L" Siege Park, Royal Army Service Corps attd. 119th Army Bde XI Corps., Royal Field Artillery. Died Wednesday 12 February 1919. Buried: HALLE COMMUNAL CEMETERY, Halle, Vlaams-Brabant, Belgium . Ref. A. 38. Private 203432. 1st/4th Battalion,, Norfolk Regiment. Died of wounds Thursday 26 April 1917. Age 36. Enlisted East Dereham, Norfolk. Son of John and Elizabeth Gowing, of Billockby, Norfolk; husband of Emma Matilda Gowing, of Clippesby, Fleggburgh, Great Yarmouth. Buried: KANTARA WAR MEMORIAL CEMETERY, Egypt. Ref. B. 131. Serjeant 19208. 1st Provisional Coy., Royal Engineers. Died Wednesday 20 November 1918. Age 29. Buried: BURGH ST. MARGARET CHURCHYARD EXTENSION, Norfolk, United Kingdom. Engineman 2383ES. H.M. Drifter "Cosmos., Royal Naval Reserve. Died Friday 15 February 1918. Age 31. Son of John and Emily Miller, of Ormsby St. Michael; husband of Flora Miller, of Fleggburgh, Norfolk. Commemorated: CHATHAM NAVAL MEMORIAL, Kent, United Kingdom. Ref. 31. Special note: H.M. Drifter Cosmos: Admiralty No 1435, Pennant No LT.477, 91 tons launched 1914, 1 x 3 pounder AA gun, net sweeper, sunk 15th February 1918 by German Destroyers in the Dover Straits. Private 4011. 1st/4th Battalion,, Norfolk Regiment. Died Wednesday 23 December 1914. Age 33. Son of the late Henry and Caroline Narburgh; husband of Edith Mary Narburgh, of Ivy Cottage, Fleggburgh. Born at Fleggburgh. Buried: BURGH ST. MARGARET CHURCHYARD EXTENSION, Norfolk, United Kingdom. Private STK/1441, 10th Battalion, Royal Fusiliers (City Of London Regiment). Died of wounds 17 April 1917. Aged 27. Born and resident Great Yarmouth, enlisted Cockspur St. London. Son of Alfred Arthur and Vestal Sabina Turner, of Pear Tree Cottage, Fleggburgh, Great Yarmouth. In the 1891 census he is listed as aged 2, born Norfolk, resident with his parents, Alfred and Upstal Turner, in Street Road, Flegg Burgh, Flegg, Norfolk. In the 1901 census he is aged 12, born Burgh St Margaret, Norfolk, resident with hhis parents, Alfred and Westal	Turner, in Rollesby Road, Burgh St Margaret, Flegg, Norfolk. Buried in DUISANS BRITISH CEMETERY, ETRUN, Pas de Calais, France. Plot III. Row B. Grave 33. Private 77795. 17th Battalion,, Royal Fusiliers. Formerly 63906 Royal Fusiliers. Killed in action on Thursday 6 June 1918. Age 18. Born and lived Fleggburgh. Enlisted Norwich. Son of Mrs. E. Turner, of Somerton Rd., Martham, Great Yarmouth. Native of Fleggburgh. Buried: BIENVILLERS MILITARY CEMETERY, Pas de Calais, France. Ref. XVIII. B. 14. Air Mechanic 2nd Class. 25701. 11th Res. Lorry Park, Royal Air Force. Died Tuesday 29 October 1918. Age 21. Son of Robert and Caroline Waters, of Fleggburgh, Great Yarmouth. Buried: DUISANS BRITISH CEMETERY, ETRUN, Pas de Calais, France. Ref. VIII. B. 42. Hawserman. Steam Trawler "Copious (Yarmouth), Mercantile Marine. Died Tuesday 3 November 1914. Age 36. Son of Hannah Waters and the late William Waters; husband of Mary Jane Waters (nee Turner), of Burgh St. Margaret, Gt. Yarmouth. Born at Thurne, Norfolk. Commemorated: TOWER HILL MEMORIAL, London, United Kingdom. Private 7953941. 1st Battalion,, Royal Norfolk Regiment. Died Tuesday 6 June 1944. Aged 22. Born 15 August 1921. Son of Frederick and Elsie Baldwin. Before enlistment employed as an Apprentice & Joiner Carpenter. Resident in 1939 at 61 Wolseley Road, Great Yarmouth C.B., Norfolk. Buried: LA DELIVRANDE WAR CEMETERY, DOUVRES, Calvados, France. Ref. IX. F. 5. Aircraftman 1st Class. 648356. Royal Air Force. Died Wednesday 19 June 1940. Age 20. Son of Alfred Ernest and Ethel Elizabeth Cooper, of Horningtoft. Buried: CLIPPESBY (ST. PETER). CHURCHYARD, Norfolk, United Kingdom. Flight Sergeant 1333947. Nav.Royal Air Force Volunteer Reserve. Died Thursday 14 September 1944. Age 22. Son of Mr. and Mrs. H. Durrant, of Fleggburgh. Buried: BURGH ST. MARGARET CHURCHYARD EXTENSION, Norfolk, United Kingdom. Basil Mark Fisher was born on 8th October 1916 and educated at Eton. he went on to read Modern Languages and History at Trinity College, Cambridge. He was commissioned in the RAFVR in July 1938 and called to full-time service in October 1939. He was then working for the Board of Customs and Excise. Fisher completed his training and joined 111 Squadron at Croydon on 12th May 1940. On 15th August, in an action with Ju88's and Me110's over Selsey, Fisher was shot down in flames. He baled out but was killed. His Hurricane, P3944, crashed at Greenwoods Farm, Sidlesham. He was 23 and is buried in St John's Church Cemetery, Eton. His older brother, F/O AGA Fisher, also served in 111 Squadron and survived the war. Second Lieutenant 113753. 2nd Battalion,, Royal Fusiliers (City of London Regiment.). Died Friday 31 May 1940. Age 20. Son of William Lawrence Thompson Fisher and Eleanor Mary Fisher, of Billockby, Norfolk. Buried: OOSTDUINKERKE COMMUNAL CEMETERY, Koksijde, West-Vlaanderen, Belgium. Ref. Row F. Grave 131. Sergeant 2235544. 189 Sqdn., Royal Air Force Volunteer Reserve. Died Wednesday 7 March 1945. Age 19. 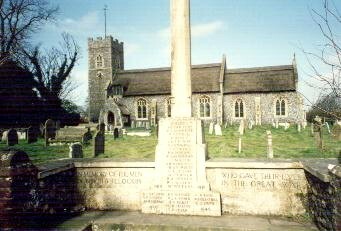 Son of William George and Violet May Gedge, of Fleggburgh, Norfolk. Buried: BECKLINGEN WAR CEMETERY, Soltau, Niedersachsen, Germany. Ref. 24. A. 4. Warrant Officer 1284578. 139 Sqdn., Royal Air Force Volunteer Reserve. Died Monday 29 November 1943. Age 20. Son of Henry Charles Jackson, and of Leah Ursula Jackson, of Fleggburgh, Norfolk. Buried: RANGOON WAR CEMETERY, Myanmar. Ref. Coll. grave 6. E. 1-6. Private 5778862. 2nd Battalion,, Royal Norfolk Regiment. Died Thursday 4 May 1944. Age 29. Son of Andre Joseph Leban and Louise Elizabeth Leban; husband of Edna Noreen Leban, of Ormesby-St. Michael, Norfolk. Buried: KOHIMA WAR CEMETERY, India. Ref. 2. C. 16. Volunteer. 11th Norfolk Battalion,, Home Guard. Died Wednesday 18 March 1942. Age 49. Son of Mr. and Mrs. Robert Paul; husband of Alice Jane Paul, of Clippesby. Buried: CLIPPESBY (ST. PETER). CHURCHYARD, Norfolk, United Kingdom. Seaman C/X 10860B. H.M.S. Pintail, Royal Naval Reserve. Died Friday 1 November 1940. Age 24. Son of Sarah Smith, of Fleggburgh. Buried: Sec. A. (Naval Reservation). GREAT YARMOUTH (CAISTER) CEMETERY, Norfolk, United Kingdom. Ref. Grave 94.